DUMBARTON and Morton shared the points in a hard fought local derby at the Cheaper Insurance Direct Stadium. DUMBARTON and Morton shared the points in a hard fought local derby in the Ladbrokes Championship on a grey day at the Cheaper Insurance Direct Stadium in front of a 994 crowd. The first half was generally low key, with Morton slowing the game down and Sons struggling to find a decisive touch in the final third. The closest Dumbarton came in the first 45 minutes was a sharp angled shot from Paul Heffernan which was deflected into the side netting and a glancing header from Frazer Wright. Jim Duffy's men had slightly more of the early pressure after the break, but then Sons began to press forward again. Just after the hour Christian Nade came close to opening the scoring, turning and firing fractionally wide of the post from 12 yards out. Moments later he headed well over from a free kick, as the home side worked hard to put the pressure on and find an opening. There were chances for both teams towards the end of the match, with the visitors striking the post, but no-one could find the net. 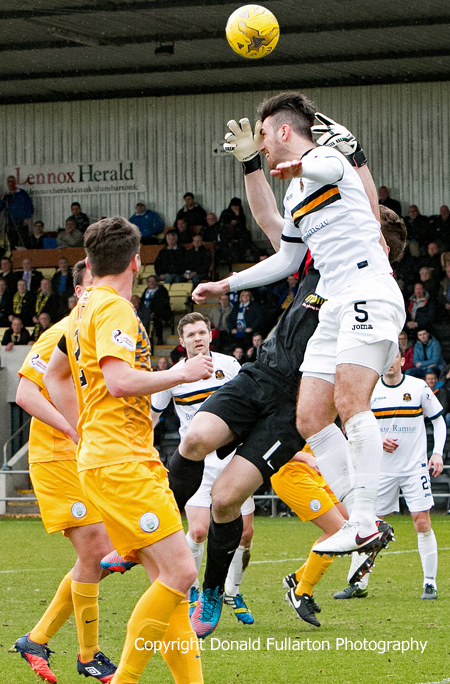 Man of the match Gregor Buchanan is pictured challenging keeper Derek Gaston.